“ … with EAC, please.” This statement is often added when a product is to be exported to Russia or another CIS (Commonwealth of Independent States) country – be it as a single device or installed in a machine. But what exactly is EAC and when do you need it? This blog post discusses the change of the certification system in Russia and the member states of the Eurasian Economic Zone (members as of 2017: Russia, Belarus, Kazakhstan Armenia, Kyrgyzstan) and names the documentation needed for the import and marketing of a product in this economic area and in the CIS. Before Russia, Belarus and Kazakhstan decided, in 2010, to establish a common customs union with uniform technical production and product standards, these countries had their own, sometimes different technical standards, which had to be complied with in the production of goods. Their own certification bodies carried out production audits and confirmed compliance with the standards with certificates. This complicated the exchange of goods between countries. Exporters also had a hard time – If you wanted to export one and the same product to these three countries, you also needed three different certificates. 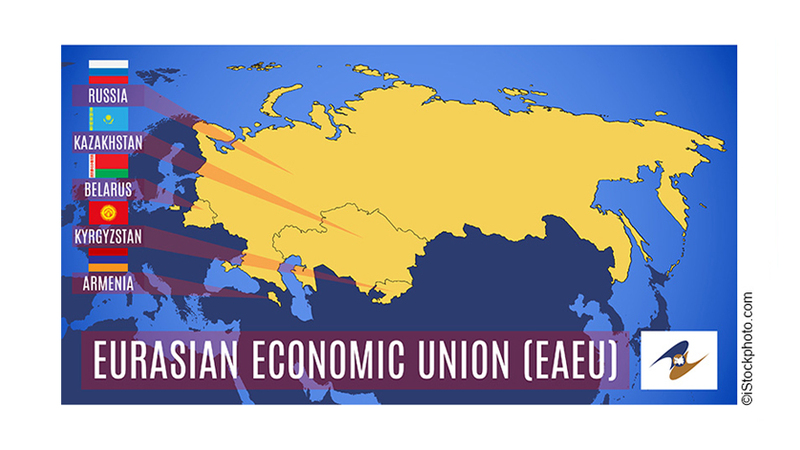 In 2010, Russia, Belarus and Kazakhstan laid the foundation for a unified standards system, which became effective in 2014: EAC (= Eurasian Conformity). The EAC certificate now replaces the previously required import certificates of GOST-R for Russia, GOST-K for Kazakhstan and BelST for Belarus. Today, all products placed on the market within this Customs Union are subject to the same regulations for manufacturing and testing, whose compliance with the EAC conformity is verified. This is similar to CE conformity in the European Union, however, EAC certificates may only be issued by authorised testing institutes, while the declaration of CE conformity may be issued by the manufacturer. Only if a product is certified or declared in accordance with the EAC standards, may it be exported to the Eurasian Economic Zone. In addition, the product must be marked with the EAC logo. In addition to the EAC certificate, which is colloquially called the import certificate, and is only necessary in the Eurasian Economic area, to market products in the CIS, further documents are necessary. The following table shows an overview of the required documentation. The majority of all WIKA products can be exported to the Eurasian Economic Union and marketed there. In addition, WIKA is authorised to issue all necessary accompanying documents and to attach the required instrument markings. Would you like to export measuring instruments and accessories to the “EAC area” and need the complete accompanying documentation from a single source? We look forward to assisting you in this. Your contact person will be happy to help you.